My first couple visits to Alabama’s gulf beaches, I rarely ventured far from the fun near those long, wide, white sandy beaches. Then, I found out about the adorable town of Foley, Alabama, only a 20 minute drive from the beach! There are so many amazing things to do in Foley, AL that I keep finding myself going back! The town is also home to the Foley Sports Tourism Complex, the Foley Outlet Mall and the world famous Lambert’s Cafe, the “home of throwed rolls.” For gulf coast sports teams, a Lambert’s visit is tradition. For parents, shopping at the Foley, Alabama outlet is a nice change of pace! So, if you’re looking for fun things to do around Gulf Shores and Orange Beach, take the short drive to Foley! If you’ll be in Foley for sports camps and competitions, look no further! Here’s your guide to everything in this historic, charming town! The OWA, Foley theme park is a hidden gem in this town. 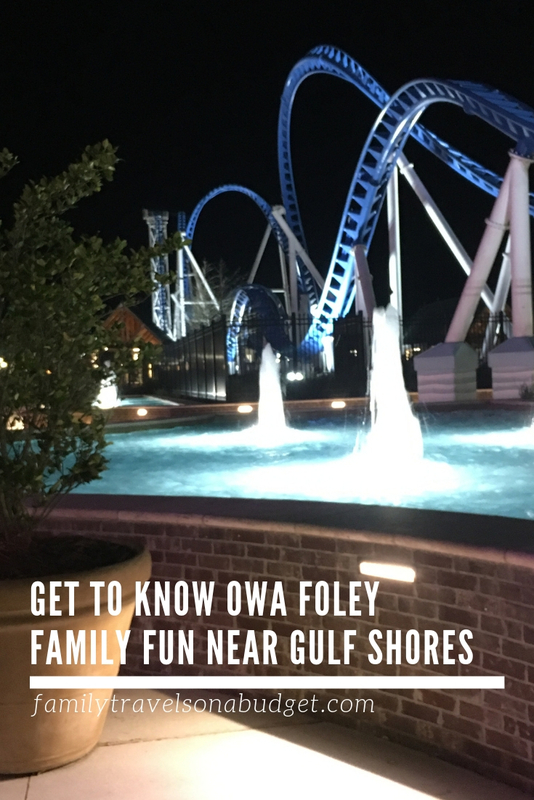 Located near the Foley Sports Tourism Complex at 1501 South OWA Blvd, Foley, AL 36535, OWA Foley provides convenient fun for visiting families. The restaurants and shops at OWA, Foley add to the fun in this walkable complex. It’s kind of like an outdoor mall and theme park combined — perfect for this part of Alabama. 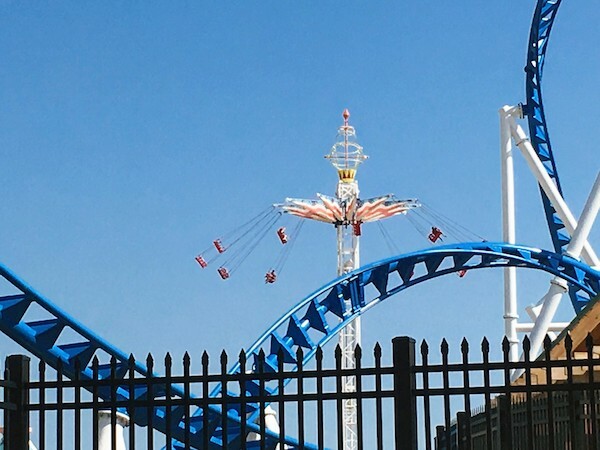 While the Foley amusement park isn’t large, it’s one of the few theme parks in Alabama, so if you want a roller coaster, this is the place to go! The Park at OWA is divided in half — with Rollin’ Thunder, the topsy turvy, twisting coaster dividing the park in two. As you face the coaster, the rides to the left are for thrill seekers, and the rides to the right are more kid focused. The Foley theme park is immaculate, spacious and relaxed. It only takes a few hours to ride everything, so it’s perfect for families who come to the area’s sports complex. Arrive a day early or stay a day late for some family fun that won’t break the bank. As to the rides at OWA Foley, Ellie gives them an adrenaline junkie’s two thumbs up! She absolutely loved the Twister ride and went back to back to back without getting sick. I’m not sure I could survive it once… Cheers to youth! While this is the largest of the theme parks in Alabama, there’s also Gulf Shores Water Park nearby. If you have time, it’s a great option seasonally. Weekdays are less crowded than weekends! My first visit to the city of Foley, I explored downtown. It’s adorable. Really! Foley, Alabama history is rooted in the railroad. And that heritage is preserved today at the Foley Train Museum. Located in the center of town, the train museum showcases the town’s history and the importance of the railroad to its development. The model train museum exhibit at the Foley Railroad Depot Museum is awe-inspiring, one of the best I’ve ever seen. (My dad is a model train enthusiast. I know my way around a model train museum, so the compliment is not far-fetched.) 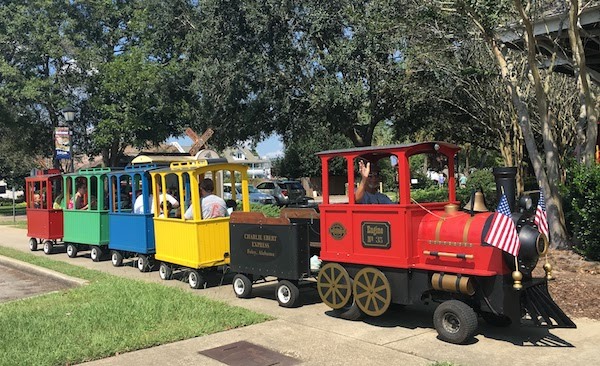 Dedicated volunteers provide FREE train rides to kids — and kids at heart — throughout the week, a highlight for the young and the young at heart. 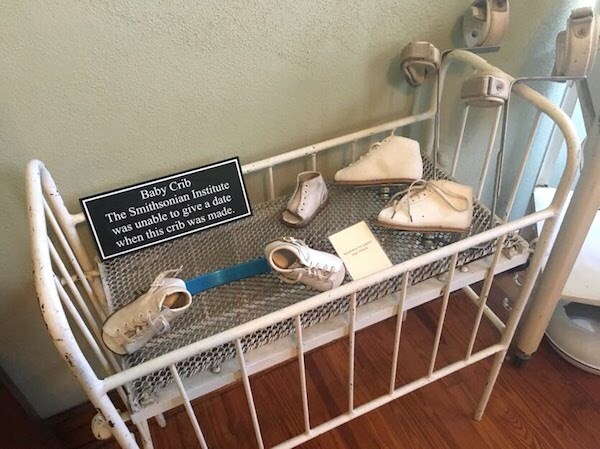 My husband is a doctor, so I knew I’d enjoy a tour of this museum. But, the Holmes Medical Museum is a time capsule of America that will make you appreciate how very far modern medicine has come. It offers a glimpse into the kindness of the human soul. And, it will help you remember a lot of historically significant street names! Okay, that last one is accidental, perhaps, but it’s true, too! Hand weaving is an art form that dates back centuries. At Clara’s Loom you can create a hand-woven piece in one day! I thought it would be difficult, but owner Celia Dionne is an enthusiastic and encouraging instructor. This is a great activity to do with kids (my opinion ages 12 plus) or friends. Allow about 3 hours total. To learn more or schedule a class, visit her site. Isn’t it time to explore your creative side? Check it out — it’s easy! The Foley outlet mall, located at 2601 S McKenzie St, Foley, AL 36535, is a big draw in this area. With 119 different stores, there’s something for everyone at the Tanger Outlet Mall stores in Foley. Always check online for Tanger Coupons before you shop, including downloadable discounts. You know us, always looking for ways to stretch the budget and coupon savings are a great way to save! Complete list of current Tanger Outlet stores in Foley. Current Tanger Mall hours and location. 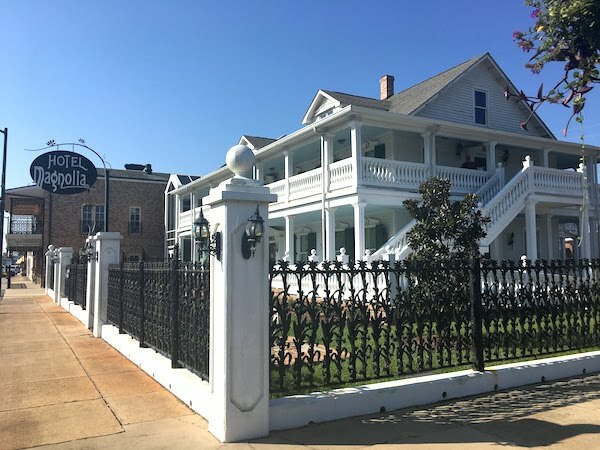 Foley’s location between Mobile and the gulf coast makes it a prime place to stay. If you’re coming to the area because of the Foley Sports Tourism Complex or to enjoy the amenities at The Park at OWA, I highly recommend the OWA Marriott. This hotel, officially Townplace Suites at Foley OWA, is located within easy walking distance of OWA Foley, and almost as close to the athletic complex. The Foley outlet mall is only two miles away. The gulf coast beaches are a short, 8 mile drive. The OWA Marriott (Townplace Suites) is an all-suite hotel offering spacious, comfortable rooms for work or play, free breakfast and a convenient location. The decor fits the surroundings, and for groups, ample public space means there’s room to gather before heading out to the sports complex or The Park at OWA. I found the staff to be very welcoming, as well. After spending a few days at the beach, I was pleasantly surprised by my stay here, and recommend it fully. For those who prefer a historic, boutique hotel experience, the Hotel Magnolia gets my top pick. It’s located on Foley’s town square in the heart of town, with easy walking to all downtown Foley attractions and restaurants. I didn’t get to stay here, but two members of the staff gave me a tour of this gorgeous property, popular for weddings (and prom photos). I hope to make an overnight visit soon! There are several hotels near the Foley Outlet Mall, many within one mile of this shopper’s paradise. Rather than recommend one over another, I suggest you choose based on the hotel perks you prefer. If you are a member of a hotel brand loyalty rewards program, choose from the hotels in Foley, AL within that group of brands. There are more than 70 restaurants in Foley, Alabama, offering everything from fresh, local seafood to southern BBQ with world famous Alabama white sauce and everything in between. Check out the Visit Foley Dining page for the most current restaurant listings. They even have an interactive guide to restaurants in Foley to make your planning easy. Such a treasure! 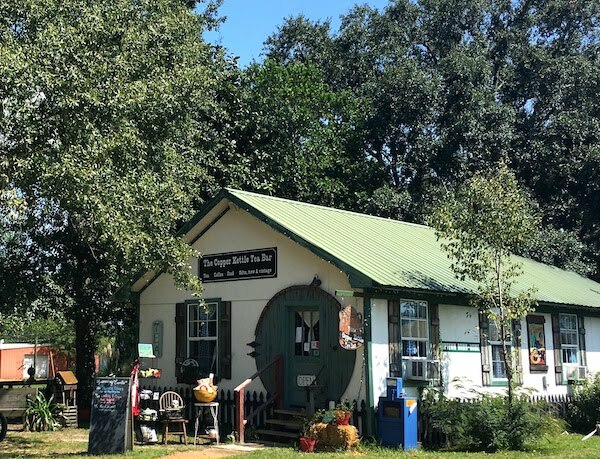 This tea house, which feels a bit like a Hobbit house, located at 106 N Chicago Street in Foley, Alabama. It’s just across the town square from the train museum, a great place to stop after your museum tour. They serve lunch and tea Tuesday-Saturday afternoons. Each day’s menu is unique, with breads, sandwiches, soups and teas being the specialties. It’s such a friendly place, you’ll feel like family as you enjoy a light, tasty meal (or snack)! When I visited, I got to know the new band director and met a young boy whose brother is battling a serious illness. The staff knew them both, and I could tell they genuinely cared. It’s the kind of place you go to feel like part of the community. And to eat good food! They don’t have a website, but their Facebook page is active. Check it out. Of all the restaurants in Foley, Alabama, Wolf Bay at 20801 Miflin Road is my favorite. With three locations (Foley, Orange Beach and Perdido Beach, Florida), it’s a coastal seafood tradition. The brand prides itself in serving high quality, fresh meals in a family friendly environment. Some of the recipes date back to the 1940s. At Wolf Bay, they know not to mess with what works! I am allergic to shellfish, so I can’t eat their famous seafood, but my land-lubber dinner was amazing, too. 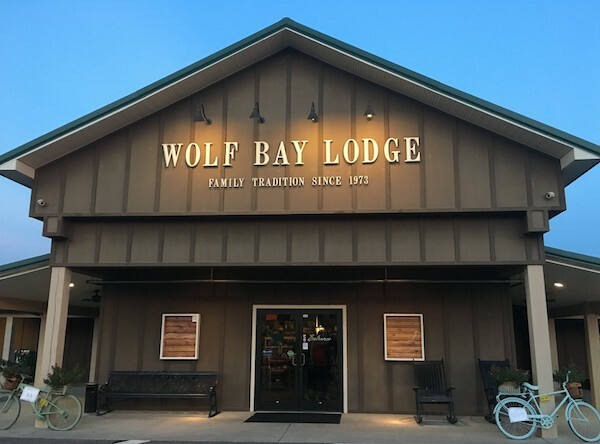 While Wolf Bay in Foley is a bit off the beaten track, it’s only a couple miles from the factory outlet mall and OWA Foley. So, true confession…. this is not my favorite restaurant. However, it’s so well loved by many of my readers that I have to include it in the Foley restaurant list. I don’t like it because it’s loud and chaotic. The food is good, not great. I found a piece of plastic in my applesauce and the manager argued with me about it saying it was apple. I know the difference between apple chunks and plastic, y’all. I’ve been eating for 53 years. But, my readers love it because it’s unique! Where else can you throw food and get away with it? I think parents like being able to play with their food and bend the rules a bit. The portions are huge — really huge! It’s good food, but you won’t leave thinking you ate the best fried chicken in the world. And, Lambert’s can seat a crowd! It’s a great option for traveling teams to eat as a group, which I can appreciate. Address: 2981 S. McKenzie, Foley, AL 36535 next to the factory outlet mall. Currently, they accept credit cards, checks and cash. Reservations are not accepted, so arrive early to eat during prime meal time (or come in about 3 p.m. to avoid the crowds). If traveling with a group, call ahead. They won’t take reservations but will do their best to accommodate your group. When you’re talking about the best things to do near Gulf Shores, the beach is high on the list! But, so is great local cuisine! When you visit OWA Foley, the sports complex or the Foley outlet mall, consider driving a bit further (it’s only 8 miles) to some of the great restaurants in Gulf Shores and Orange Beach! Southern cuisine, fresh seafood and farm to table dining are popular here — I dare you to try them all (that’s a good dare for you)!